This site has absolutely everything about the remarkable animated series, "The Big O." 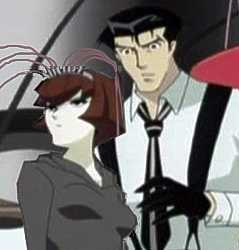 Possibly the worst-named anime in history, The Big O is not about orgasms, though it's so enjoyable that it comes close! You'll discover that it's a very unusual series with many levels of secrets, and you'll find that this makes the show mysterious and fascinating, something you'll watch over and over and keep coming back to. In rough outline, the show follows the adventures of Roger Smith, a negotiator/detective who is also the secret posessor of a giant robot, "Big O." He soon acquires a lovely, sharp-tongued android sidekick, R. Dorothy Wayneright, and during the series he is almost completely unaware that they have fallen in love with each other. 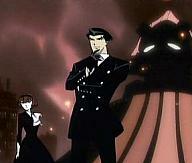 The Big O airs in the U.S. on Adult Swim by Cartoon Network. The series was released on DVD by by Bandai. Recently, Adult Swim has been airing only Season Two. You really need to watch both seasons, in order, and that means you should buy it on DVD. You can get both seasons on DVD from Amazon.com. Laugh yourself silly with hundreds of screen shots from "The Big O" with funny captions by yours truly. These include scenes from every episode. Follow this link to see my retouched images. Some are funny; some are serious. And I tell you how to make your own! It's easy. Fanfiction: A Whole Season 3 For Big O! You won't believe it until you see it! Read a complete third season of Big O. Giant Robot battles! Android romance! Creepy villans! More giant robot battles! And answers to all your questions about how Paradigm City really works. Widely praised, you'll see why when you read it. What is The Big O? An introduction to the series. NEW! Creating Your Own Fan Site. Follow these steps when creating your very own site with the name of your choice. Big O DVDs, Manga, Art Book. Stuff to buy. NEW! Links to individual fan artists and sites with fan art. More Big O sites can be found here. 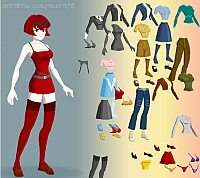 Use this Flash program on DeviantArt.com to dress (or undress) R. Dorothy just the way you like her! Save this banner and use it to link to this site (http://www.r-dorothy.com). Send me an email if you want a link back.